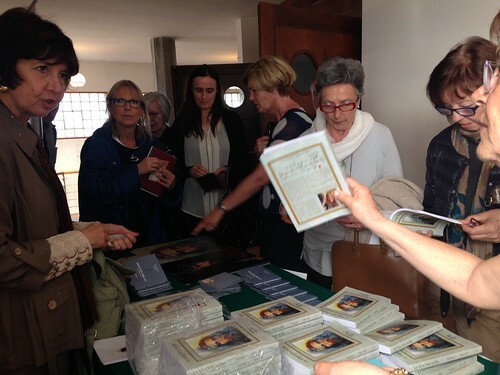 A renewed interest in the True Life in God messages along with the publishing of the Italian version of Book One containing all the True Life in God messages inspired an invitation for Vassula witness in Italy. A priest, Fr. Rolando, who has been reading the messages for many years, met Vassula with great joy during our True Life in God pilgrimage last year, while we were visiting Napoli and Pompei. Our Italian TLIG Association, led by Francis Mifsud, asked him at that time whether he was interested in inviting Vassula for a talk in Napoli. With enthusiasm Father Rolando welcomed the idea. On Friday morning May 20th, we flew to Venice and from there drove to Pordenone. It is a beautiful town of 50 thousand inhabitants, an hour’s distance from Venice. 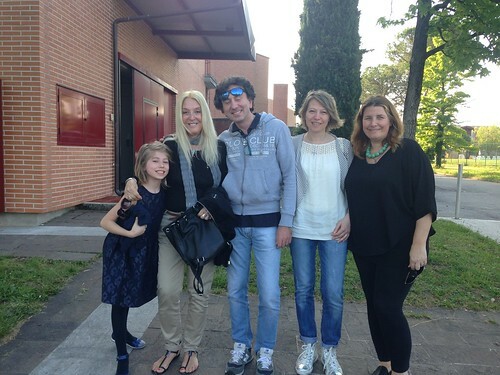 Upon arrival, Daniela and Bruno Sodano were waiting for us at our hotel. Both new readers of the True Life in God messages, they are a husband and wife couple with two small children who could not hide their enthusiasm and joy that Vassula was to speak in their small town. 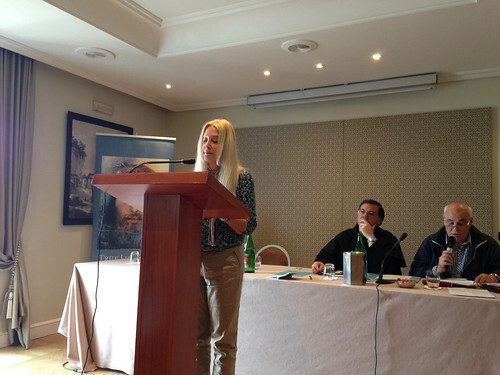 Later on that evening, Caterina Delfini, the translator of the True Life in God messages in Italian, also arrived at our hotel. During dinner, Daniela told us how she discovered the True Life in God messages. A year and a half ago, at a funeral, her mother introduced her to Eugene, an Italian who had been living in Kenya for many years. Daniela was not in a mood to talk and tried to avoid the introduction…It was too late. Eugene spoke to her about his conversion through the True Life in God messages. He suggested that Daniela must find them and read them. Daniela searched many bookstores, but could not find them. Later, she started to search on the internet where she found two phone numbers. She called the first number and was told that these books are not published anymore. She then called the second number, which belonged to Francis. Fiorina, Francis’ wife, indicated to her that this number was a home number and not a bookstore, but Daniela wanted to leave them her phone number. Time passed and Daniela had almost forgotten about the True Life in God books. She figured that it was very likely impossible to find them or become a member of a True Life in God prayer group. Three months later however, she received a phone call. It was Fiorina on the other side of the line asking her if she still wanted the TLIG books. Incidentally, the Misfud family’s country house was near Daniela’s home, so Daniela had the opportunity to meet the Misfuds personally, receive the books, become acquainted with the Misfuds and by the grace of God move forward together with them in organizing Vassula’s talk in Cordenons. 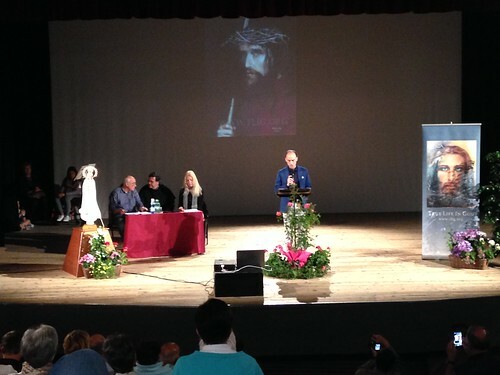 The next morning, Saturday May 21st, accompanied by the organizers, we went to the cultural centre Aldo Moro, where the True Life in God talk was to take place. At the venue, the sound, lighting and microphone check was being completed, so as to ensure that everything was working fine for the talk. Vassula’s talk was scheduled for 4 o’clock that afternoon. The event location was ready with the melody from violin chords creating a lovely atmosphere. It was also a pleasant surprise to witness the arrival of 30 Slovenians who traveled by bus for 3 hours, from Slovenia to Pordenone, to listen to Vassula’s talk. One of the Slovenians, Frank, who videotaped the event, has been reading the True Life in God messages for more than 20 years. He is a member of a TLIG prayer group and had interviewed Vassula 20 years ago when she used to live in Switzerland. He spoke with passion and love about the messages that changed his life and today he works to spread the Lord’s messages in his country. 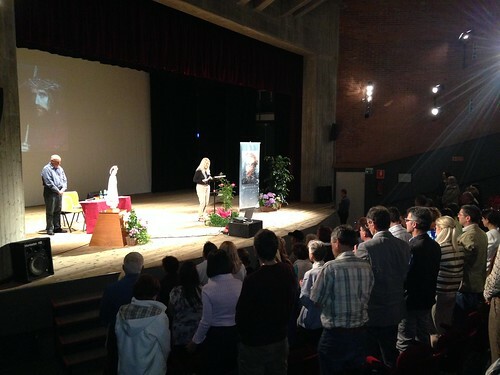 Vassula’s speech, which was simultaneously interpreted by Francis, kept the audience’s interest alive. The audience included young people and couples with their children who were hearing Vassula’s story for the first time! The audience listened to Vassula’s stirring testimony and applauded continually. Vassula said that God wants to save every one of us; the applause belongs to Him and His Mother, pointing to the icon of Jesus and the statue of our Holy Mother that were on the stage. Among the audience’s participants was Father Claudio, who has been meditating on the TLIG messages for more than twenty years. 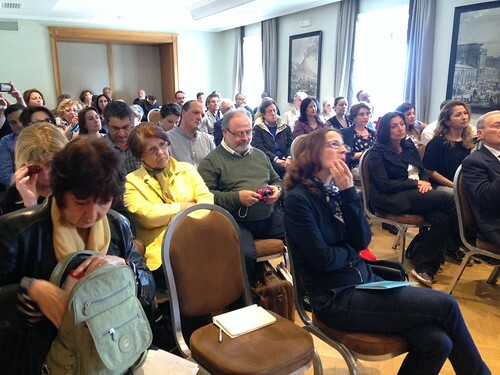 He had travelled for 4 hours from Verona to listen to Vassula’s talk. Before leaving the venue, he thanked Vassula warmly for her work. The noteworthy fact that a priest travelled so many kilometers to hear the messages from Vassula’s mouth shows that Wisdom enlightened him to understand the value of the Messages, to thirst for what is holy. The more one drinks of this wisdom, the thirstier one becomes. This example depicts the contrast between this wise priest and those who reject TLIG without having read a page, misguided by slander and misjudgment from others who have never read any part of the messages. In spite of difficulties and obstacles, Vassula’s talk took place through the power and the grace of the Holy Spirit for the Glory of God! The Lord’s Spirit was powerfully felt in the audience; here we want to specify that any success the meeting has had, in fact all meetings have had, is due to the many prayers said for this mission. Vassula always states that she does not want to appear as though she succeeded; any success that unfolds is due to the presence of the Holy Spirit. We also have to remember that the Lord’s power works at its best the weaker we are. When we invoke the Holy Spirit to guide us in our day to day lives, we might appear that we are defending ourselves in our thoughts and opinions, yet we are in truth defending the Word of God, not ourselves. A true apostle continues speaking and working for God without hesitation, whether the road is rough or smooth. The Word of God is not like human speech; it comes down like a hammer, pounding with authority, but at the same time, like a melody: a poem that soothes the heart and heals it! It is filled with tenderness, mercy and an ocean of love. The manner in which God manifests Himself to our generation today through the True Life in God messages is an immense blessing! In fact, what one can say is that True Life in God is a call of Mercy. In this era of the great apostasy which has been foretold in Scripture, while the Christian world is collapsing, the grace of Jesus Christ, the love of God and the fellowship of the Holy Spirit is present to revive what is in ruin; this is why the Holy Trinity approaches us. The books were very popular. People asked Vassula to sign them and wanted to take photos with her. Some of the attendees very willingly accepted to give a personal testimony about how they discovered the True Life in God messages and what it was that touched them most in Vassula’s speech. I am Alessandra Ponte, I live in Treviso. I heard about Vassula’s books and her life about 10 years ago through my mother, Nicole Manuzzato who lives in Caracas. At first I read the book ‘My Angel Daniel’ and I was soon very impressed to learn that an angel could approach a person who was not attending the church and was not leading a ‘holy life’; a situation in which we all live and of which we question ourselves about. Soon after I read this book, I started to read the Messages given by Jesus and I realized that there is hope and redemption for all of us. Jesus loves us infinitely and He wants the best for us as; we are His children. I think that when we have Him by our side, disciplining us, must be the most beautiful experience we can have in life. I would like to always be with Jesus and to never again separate from Him. My name is Esther and I live in Udine. I began reading the Messages many years ago. They are so beautiful. They confirm the validity of my relationship with God, a path in life that still continues; it grows and confirms that what Vassula is doing is right. I received a very good impression of her; she is a very beautiful person inside. Her testimony is incredible; the way she was contacted by Jesus to walk this path is an amazing thing. God chooses the individuals He wants to reach in the manner He likes. My name is Gemma. I think that what Vassula said is fantastic; it is beautiful. I wish that all priests would speak like she does when sermonizing from the pulpit; there would then be a general conversion among us. I learned about the TLIG messages through a monthly magazine I subscribe to: ‘Il Segno del Soprannaturale’ (The Supernatural Sign. My name is Samovits Stanuel. I am a doctor and have come from Slovenia. I believe in the authenticity of the TLIG messages and that Vassula is a true prophet of God; for this reason she is slandered and persecuted. My name is Dean and I am from Slovenia. I was impressed and touched by Vassula’s talk today. I have been participating in a TLIG prayer group for some years and I work towards spreading the True Life in God messages. This Message must become known worldwide; people must learn that Christ is LOVE and that we must all unite under His Holy Name! Three members of a family: a father, a mother and their twelve year old son, who travelled from Milan to listen to Vassula gave us their testimony: My name is Roberto and I am from Milan. I learnt about Vassula from my father in law. He spoke about her for years. My wife reads the True Life in God messages on the internet. When she was informed that Vassula was to speak at Cordenons, she asked me to go there to listen to her, even though Milan is quite a distance from Cordenons . The event was truly lovely. I feel that it was a very nice talk, very impressive. I now feel as though I have something more in me spiritually, something more to do for myself and others, something more to think about and to talk about with others. This is my son Leonardo. My name is Leonardo. I am twelve years old. I believe that Vassula is very lucky to have this revelation and ability to talk with Christ. I would like to be like her when I grow up… and talk to people about Christ. My father introduced me to Vassula’s encounters in the True Life in God messages 30 years ago. Through these messages the beginning of my conversion began last September and I now feel Christ is present and is speaking to us today. Christ makes me feel His presence every day through small things. I believe that Christ is truly giving the True Life in God messages to Vassula. My name is Paolo. In the Messages there is a real presence of Christ. I have recognized Him through Vassula’s words because one can feel that the one who writes these words met Jesus, who loves us all infinitely. I can tell you only one thing God is not able to do: stop loving us. When a soul recognizes God’s love, God’s love comes back; the soul recognizes the Father and starts to love Him as He loves us. My name is Eugenio Francescon and live in Kenya. I have, in the meantime, taken time off in Italy to be in prayer and currently live in Pordenone. In 2006, whilst in Kenya I was not at all well, I was dealing with many issues and difficulties. For this reason, I was very angry with God because He didn’t help me during my troubled time. As a remedy to the problems I had, my parish priest offered me a room to sleep in on the parish grounds, next to the Adoration Chapel. However, I was not mentally or spiritually able to pray or read the Scriptures, nothing. I would only sit, shake and cry. One day I went into the chapel on my knees and bent down, as always, touching my head on the floor. I suddenly felt a strong power overwhelm me and my head turned towards the right. There was a bookcase and my eyes rested on a purple book. I reached for it and started to scan it. I repeat, I didn’t want to read anything… and yet, I sat, and started to read it… and I saw this lady called Vassula… Vassula, Christ… Vassula, Christ… I said to myself, what is going on here? I browsed through the book and read… this is a lady, a blonde lady to whom Jesus is speaking now? I thought Jesus had left us 2000 years ago and was in heaven, not here on earth! I continued to read that she is the wife of a diplomat, having a worldly life. She is a tennis player, and I was also a tennis player with a worldly life… I thought: this is lovely! I mean, I too can be with Jesus; I too can talk to Him, speak to Him… So, I started to read the book daily in the Chapel as it had to remain there. I was very excited with it and wanted to buy a copy. I asked James Ndirangu, a friend of a friend, who happened to be at the chapel, where I could purchase this book. He suggested that I contact Larry Wambaa and Sam Njuguna. James then talked to me about Vassula and the messages. He told me that she really, truly, receives them; he had personally met Vassula when she visited Nairobi. He then took me to a charismatic prayer group. The True Life in God messages came into my life when I was at my lowest point… I was dead. God came into my life through these messages. I thereafter felt, once again, the desire to pray, especially the Rosary and to read and meditate the Word in the Bible. I am truly grateful to God for making it possible for me to discover the joy in living His Presence. On Monday morning, May 23rd, we headed towards the train station with Father Vincent, Francis and Fiorina destined for Naples where Vassula was to give her next talk. 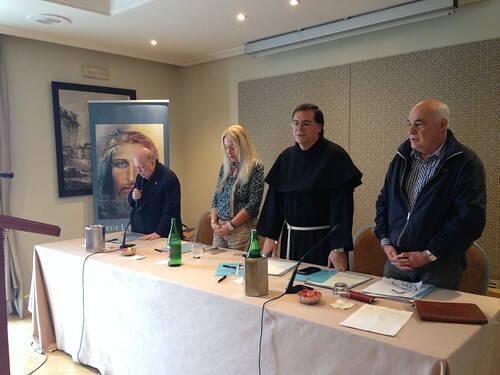 At the Naples station, Father Rolando Palazzeschi, a Jesuit priest who began reading the TLIG messages many years ago, welcomed Vassula and the whole delegation with lots of love and with the expectation of a small child! Happy and demonstrative, smiling, he constantly held Vassula by the hand… I remember seeing him during the last TLIG pilgrimage in Italy, when we had visited Naples, just before mass started in the Basilica of our Lady of the Rosary in Pompei. I remember Father Rolando receiving Vassula with a big hug, while shouting from a distance when seeing her enter the church: “Vassula, mamma mia!” This was the first time they had personally met. 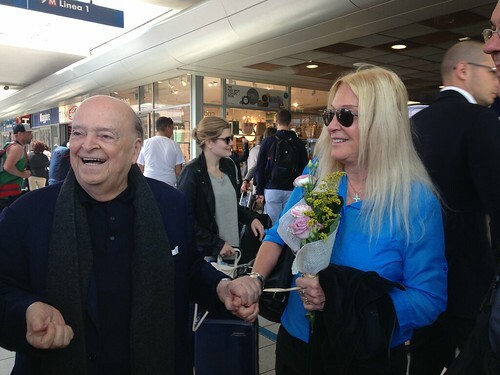 At that time, Father Rolando asked Vassula to return to Naples in the spring, so as to give her testimony! Vassula exclaimed that anything we do should be offered to God with love. Christ asks us to imitate Him; always remember that we are united with Him. Finally, Father Vincent read a TLIG message from February 16, 2016 and recited the message’s prayer, together with the participation from the audience. As a conclusion to the event, Francis spoke about the Beth Myriams, (the houses of Mary, helping the poor and impoverished) which are spread all over the world, along with information about the work they do. He spoke about the fact that prayer groups are the living cells of True Life in God; they work to promote the spreading of the messages for the glory of God. As an impetus, he informed the audience that the Italian TLIG Association was offering the 1st volume of the messages for free. The book which contains all the messages from 1986-2003 was sold out. Whoever was interested in having it, ordered it by post. 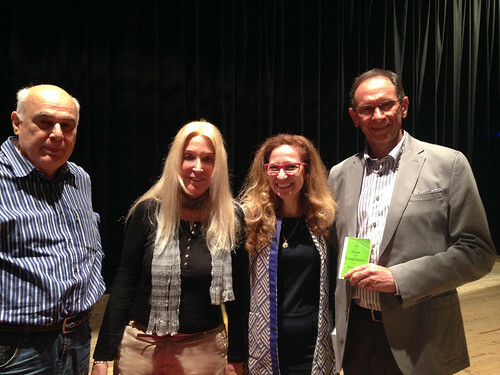 A DVD of a talk by Vassula with Italian subtitles was also available for the audience. My name is Andrew. I am a new seminary student. I had heard about Vassula in my country, Poland, about three years ago. Since then, I have watched her speeches on the internet, I bought the TLIG books and the book “Heaven is Real but so is Hell”. For the past three years, I have been following the news regarding her mission. The messages give me peace, joy and much helpfulness towards augmenting my faith. I entered the monastery three years ago, here in Naples. When I heard that she was coming here, I immediately decided to attend this gathering, so as to listen to her talk. I am very happy that I managed it and I am finally here tonight! My name is Loredana. I met Jesus and I have read Vassula’s books. During the event, I felt a big and deep joy, as if Jesus was talking to me. My name is Sheila; I am from Naples. Vassula’s words have confirmed a reality that I experienced in my life: the continuous communion with Jesus in my daily life. By listening to what Jesus says to Vassula, I had the confirmation that I must continue this daily communion with Jesus; Jesus and me, we are one. My name is Alessandra La Rosa. I was introduced to Vassula’s books by Father Rolando. At this moment I am very touched, involved and nourished by this very strong testimony. I would now like to remain in touch with the TLIG community; I am willing to actively offer my assistance. I do not know when I will be able to assist this mission, maybe at an event in Rome. I very much felt God’s word through this woman. My name is Rosa. Thanks to Father Rolando, I became acquainted with Vassula’s books. I read My Angel Daniel, and then started to read the first volume of the True Life in God Messages. Unfortunately, we are often afraid to approach a person who speaks with God. As Vassula said, we often fear Christ because we have been living away from Him for too long a time, so it is difficult to see the light after living a long time in the dark. By listening to these words of love spoken by Vassula, God’s loving words, your spirit opens to an impetus which was previously blocked. My spiritual suffering, my block, comes from my inability to allow God to love me. I am now discovering through the TLIG messages that God loves us even if we are nothing, even if we are little worms; this is a beautiful revelation. Since we all are lacking and in need of prayer, Vassula asks that we pray for individuals we do not know; we need to pray for all people, not only for those who are near us in thought and location. Our immense impetus towards God lies on letting go of ourselves through prayer, so as to let God work through us for His glory. 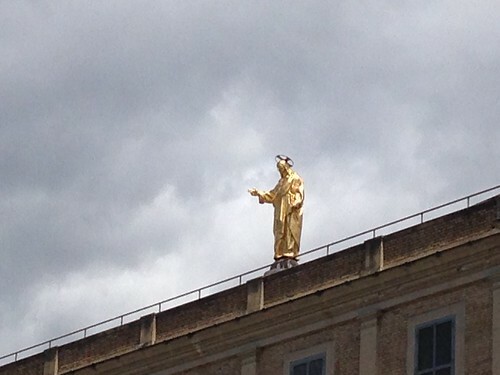 Jesus blessings, at the train station of Rome. During our stay in Rome, we noticed the presence of a lot of tour groups from different Asian countries: Japan, Korea, and China… Vassula mentioned that the number of Christians in these countries, in spite of the persecutions, is constantly increasing for the Glory of Christ. She remembered her mission to China several years ago and thought that perhaps it is time to go again! 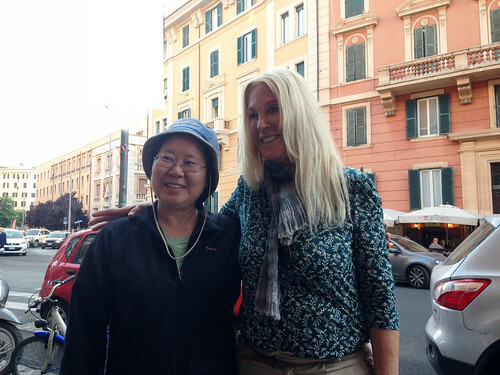 The Chinese guide who became the nun Maria, with Vassula in Rome. She turned her attention to Vassula and asked her if she remembered her… Vassula replied saying she did not remember her. Graciously, the Chinese woman introduced herself. “I was your guide at the Great Wall, when you came to China!” Her name is Maria and she is a nun. Vassula then remembered her. We then remembered the morning’s discussion about Asia, especially the mention of a mission to China… Maria, along with her sister both became nuns. Last year they came to study in Italy and were trying to find a TLIG prayer group that entire year, with no avail. Now the prayer group was right in front of them! The necessary introductions were made with Francis, and Katerina; e-mails and phone numbers were exchanged and they were informed of the day and time of prayer. Their plans were to return to China at the beginning of June. They told us that they habitually never cross this street, but today they spontaneously deviated from their normal walking route; we all knew why! Nothing happens by chance! Maria gave her card to Vassula and asked for her phone number saying that she will invite her to China sometime soon! That same night, Vassula had the opportunity to speak to some friends who are participants in the TLIG prayer group in Rome and who work for the Lord’s message. She gave them some useful instructions and advice about how to organize her future talks. She suggested that they form an event committee, explaining that every TLIG prayer team is in effect a committee. Before every TLIG event, the members of the prayer teams undertake the predetermined responsibilities for the event. We are all given an opportunity to become God’s warriors: to proclaim His Love to a dechristianized world! The struggle towards Christianizing our world continues and is fought every day! Vassula’s mission to the two cities in Italy was the precursor of a new and bigger mission in this country. 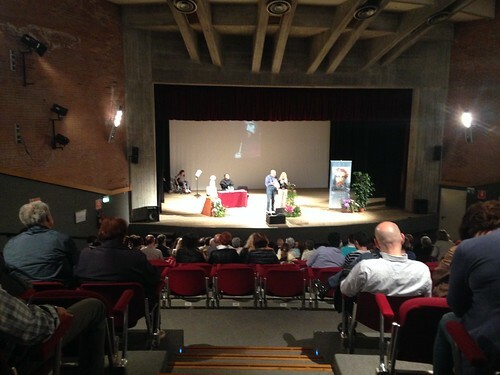 God’s plan to spread His message in Italy is just beginning! However, one stone can hit two birds at the same time: Italy and China. May God’s grace continue to be revealed so that the whole world finds integrity and gives up everything that does not lead to God and towards our final destination which is Heaven.